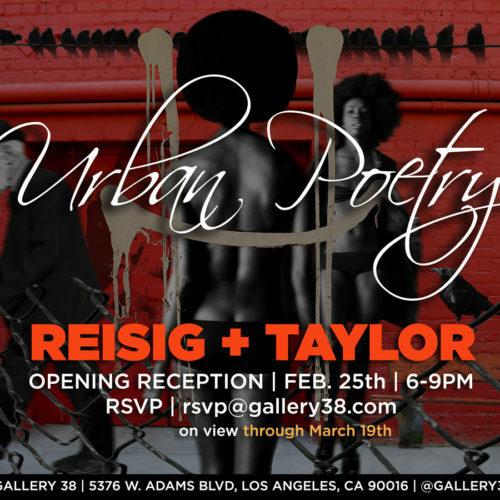 Gallery 38 is pleased to present Reisig and Taylor in their solo exhibition, Urban Poetry, featuring lenticular photography that explores elements of the urban experience. The title of the exhibition refers to the manner in which the subjects and the landscape work in concert with each other to narrate a new reality. Collaged into single landscapes, These works evoke the idea of a connected and interchangeable humanity, allowing its subjects to forge a new identity in alternate environments. Artists Chris Reisig and Leeza Taylor, whose creative and life partnership spans nearly 25 years, continue their exploration of the photographic medium with each new body of work. Their art practice reflects the life they have forged together, their children and the friends that are adsorbed into the family. Like many of Reisig and Taylor’s collaborative projects, the physical and emotional landscape of their own domestic space, becomes the point of departure for their artistic vision.